Release data is collected from all Firefox users. Prerelease data is collected from users on Firefox Nightly and Beta channels. Users may choose to turn the data collection off in preferences. ATMO is mainly used to write custom analyses; since our users aren’t necessary data engineers/scientists we chose Python as the main supported language to interface with Spark. From ATMO it’s also possible to schedule periodic notebook runs and inspect the results from a web UI. As mentioned earlier, most of our data lake contains data serialized to Protobuf with free-form JSON fields. Needless to say, parsing JSON is terribly slow when ingesting Terabytes of data per day. A set of ETL jobs, written in Scala by Data Engineers and scheduled with Airflow, create Parquet views of our raw data. We have a Github repository telemetry-batch-view that showcases this. A dedicated Spark job feeds daily aggregates to a PostgreSQL database which powers a HTTP service to easily retrieve faceted roll-ups. The service is mainly used by TMO, a dashboard that visualizes distributions and time-series, and Cerberus, an anomaly detection tool that detects and alerts developers of changes in the distributions. Originally the sole purpose of the Telemetry pipeline was to feed data into this dashboard but in time its scope and flexibility grew to support more general use-cases. No, not really. If you want to read more, check out this article. For example, the DWL pushes some of the Telemetry data to Redshift and other tools that satisfy more niche needs. The pipeline ingests logs from services as well and there are many specialized dashboards out there I haven’t mentioned. 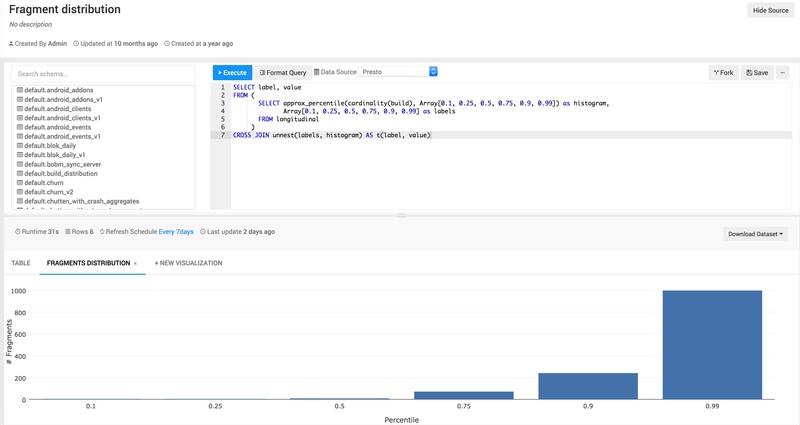 We also use Zeppelin as a means to create interactive data analysis notebooks that supports Spark, SQL, Scala and more.